The manufacturers tell us this thing uses real-time looping for its sustain effect — the pedal continuously stores a short section of what’s just been played. When you press the foot-pedal, the digital engine takes a very short segment of the last played sound and intelligently loops it to provide the smoothest-sounding result. For example, if you play a chord and then press the pedal, a short section of the chord’s natural sustain can be looped indefinitely while the pedal remains depressed. The 26kHz sample rate means the audio bandwidth of the effect is a hint under 13kHz, but that’s only for the sustained sound — the analogue dry path has a full 20Hz to 22kHz bandwidth. In practice, it’s more than adequate for pretty much any source you’ll want to use this with. The 16-bit sampling resolution provides a decent enough noise performance, too. The pedal requires a 200mA (9V DC centre-negative) power supply, which isn’t included. The character of the sustained sound is related to the time between the attack of the chord or note and the pedal being pressed. For a synth-like sound or a distorted guitar sound, the manual suggests pressing the pedal soon after the note attack. For smoother sounds, a slightly longer interval between the note attack and pressing the pedal is suggested. Once the pedal is pressed, the note or chord will sustain for as long as the pedal is pressed down, then when the pedal is released, the sound decays at a rate set using the Tail control. 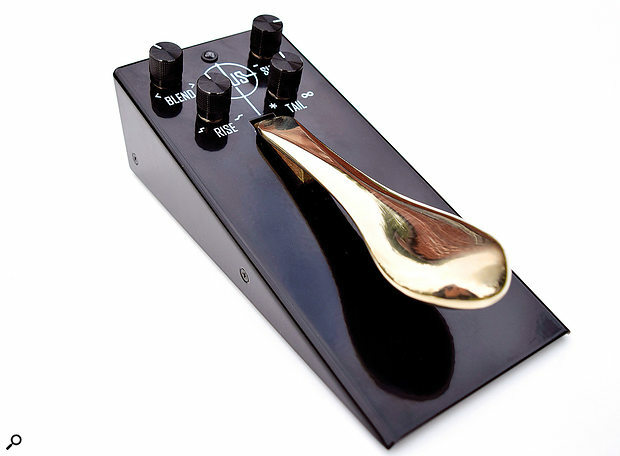 Note however, that the pedal has a halfway position that reduces the level of the sustained sound and also takes off a little top end, to allow for more expression during performance. I have to say that the build quality of the hardware is fabulous: a piano-style sustain pedal is mounted upon a very weighty steel chassis, and I don’t know what type of rubber was used on the base of the unit but once you put it on a smooth floor there’s no shifting it! There’s an option to take separate outputs for the clean and ‘added sustain’ sounds, an effects loop for treating just the ‘wet’ part of the sound and controls that adjust the shape of the sustain. There’s also a novel sustain layering system. By way of connectivity, there are jacks for In, Out Clean/FS and two more jacks for the aforementioned effects loop. There are also two slide-switches on the right-hand side of the case: Group/Single and Split/Mix. Split/Mix determines whether the output is a mix of the dry and effected sound, which would be the norm for basic sustain use, or separate wet dry feeds for the creation of special effects. Group/Single relates to the layers mode, which I’ll get to shortly. Clean/FS can be used to take the dry output separately from the effected output but also doubles as a connection point for the optional latching Wet footswitch, which also includes its own dry output jack. This separate switch is useful for creating tonal washes without hearing the dry sound, effectively putting the Split/Mix slide switch function under foot control. When using this to switch off the dry signal, it’s possible to build layers of ambient sound — you can then unmute the dry sound and play on top of the layers. Four rotary controls on top of the box are labelled Blend (wet/dry mix), Sustain, Rise and Tail. Rise sets the rate of build-up of the sustained sound, while Tail looks after the decay time when the pedal is released — and if set to maximum, the note will keep on sustaining indefinitely even when the pedal is released. Sustain is less obvious, as it works in different ways in Group and Single mode. In Single mode, holding down the foot-pedal sustains the most recent note or chord, and any previously sustained audio will fade out at the rate set by the Tail knob. In this mode Sustain brings about a gradual reduction of high frequencies, to emulate the effect of a real decaying string sound. In Group mode, up to five sustain layers can be created to build up huge sounds, the position of the Sustain switch setting the number of layers you want to work with and the LED flashes according to the number of layers selected. Layering works rather like voice allocation on a synth, where creating a sixth layer in the five-layer mode overwrites the first. A short ‘fully down’ tap of the pedal kills all active layers, while a short half-press removes only the last recorded layer of sustain. To make layering work, the Tail control needs to be set to give a long enough sustain time for you to build up the layered sound. (The infinite Tail setting might be useful here.) Tonal settings dialled in using the Sustain knob while in Single mode are retained when you switch to Group mode. If the Group layer is set to one (Sustain knob fully anti-clockwise), previously sustained sounds will cut off as soon as a new one is held, to avoid overlap. Despite what might seem to be a lot of options, the Plus Pedal does what its manufacturers claim, and it’s very easy to use. You have to experiment a little with the Rise and Blend controls to get a natural-sounding crossover between the dry sound and the added sustain tail, but that’s easy enough to achieve. The actual character of the sustained sound does indeed depend on when, during the decay of the original sound, you press the pedal. Press it too soon and you can end up looping elements of the sound’s attack (not what you’d usually want, though it can sometimes produce some musically interesting results). The length of the loop seems to vary, and depending on the source, you might hear a gentle cyclic modulation every quarter to half a second or so — though in some cases this adds a little welcome movement to what would otherwise be a static sustain sound. I suspect the variations in loop length come down to what the software deems is the best loop point for the note that’s just been played. The layering mode works exactly as specified, though you must be careful not to let the sound build up into something too dense and muddy. Using the wet-only sound to create chordal pads and washes is really effective, and the addition of some third-party delay, reverb, modulation and so on can make things more interesting still. So, is it worth it? Well, if you simply want a basic ‘freeze’ function with no separate wet and dry outputs, the EHX Freeze pedal will do the job for a lot less money — though note that it also sounds a little different; while the EHX system produces no audible loop, there’s a somewhat diffuse quality to its sound. With the Plus Pedal you get super-solid build quality, a useful amount of flexibility (including that layering option), and an ergonomically practical sprung sustain pedal. There’s a lot to like, especially if you like pushing the boundaries of what you can do with the signal from a regular guitar or other conventional sound sources. Plus pedal €337.59; Wet footswitch €47.12. Prices include Latvian VAT. Plus Pedal €279 (about $340 when going to press); Wet footswitch €39 ($48).